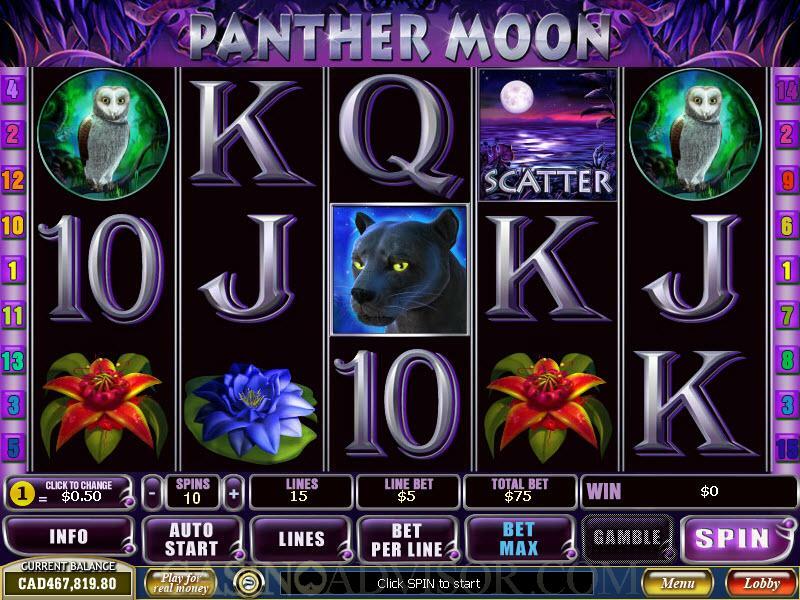 Panther Moon is a uniquely themed video slot game that is part of the new set of slot games that have been launched by Playtech. The game has five reels and 15 pay-lines. The game is a very fun and exciting game that is aimed to provide hours of entertainment for all the players. It has a night time jungle theme, which means that all the characters featured in this game are those that prowl through the forests in the nighttime. 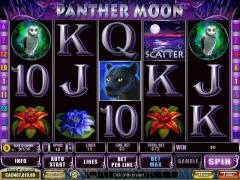 The game is beautifully laid out in black and purple to give the player the feeling of playing a slot game in the middle of a jungle in the night time. There is a wonderful soundtrack that accompanies it, making it all the more exciting. The graphics and animation are also designed to complement the theme. Although the panther, which is the main attraction of this game is a bit elusive, the other night-time creatures like owls and wolves are in abundance, creating a wonderful effect indeed. 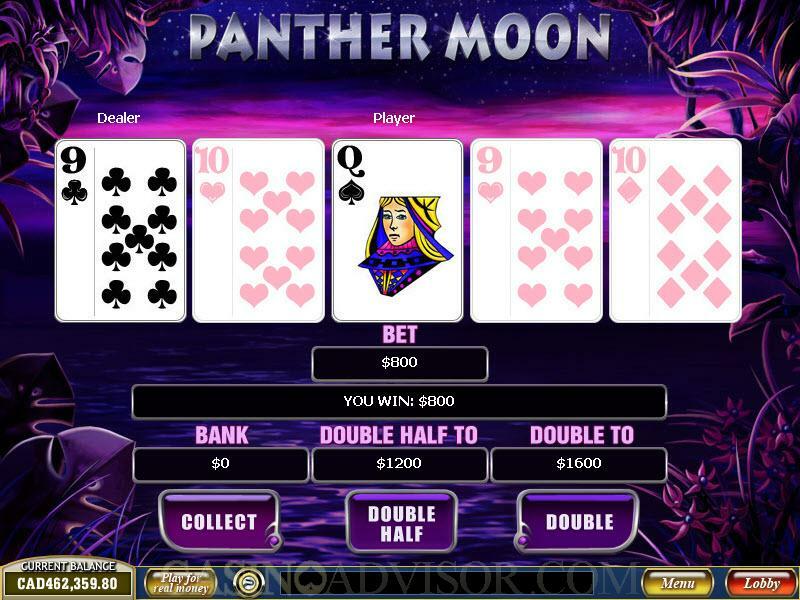 The symbols and the background of the game are a wonderful accompaniment to the number of prizes that are a part of Panther Moon. For players who would like to enjoy the game without spending any money on the reels, many Playtech casinos offer this game for free. The only drawback is that the players who are not ready to wager real money do not have a chance to win any of the prizes. For those who want to play for money, the coin denominations range from $0.01 to $0.50, which is a slightly low range of denominations, but since the player is allowed to wager up to 10 coins per activated pay-line, the maximum wager is $75, which is acceptable to most mid-rollers. To begin playing the game, the player must choose his/her wager along with the number of pay-lines that he/she wishes to activate. The player can then choose to use the autoplay feature which, when the number of spins is set, will give the computer permission to play on the player’s behalf. This is especially suitable for players who wish to take a short break from the computer, but do not want to pause the game. The regular symbols in this game are the Owl, Wolf, Flower, butterfly, Ace, King, Queen, Jack, Ten and Nine. These symbols are the ones that appear on most of the spins, and they have a payout associated with them when three or more regular symbols appear. This makes the number of winning combinations possible in the game very high. The Panther symbol is the wild symbol in this game. This Panther symbol does not act as a multiplier. The wild symbol substitutes for all other symbols to complete a winning combination, but it does not substitute for the scatter symbol. The scatter symbol is the Sun Setting on the Lake symbol. This symbol can appear anywhere scattered on the reels. When this symbol appears more than twice, then the scatter winning combination is completed. The player has a chance to win up to 500 times the initial triggering bet when two or more scatter symbols appear on the reels. When the player gets more than three scatter symbols on the reels, he/she is rewarded with 15 free spins. During the free spin round, all the payouts for winning combinations are tripled. 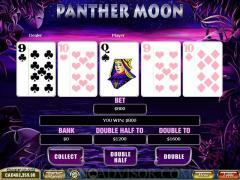 Interested in reading more detailed information about Panther Moon? If so Click Here for more details.